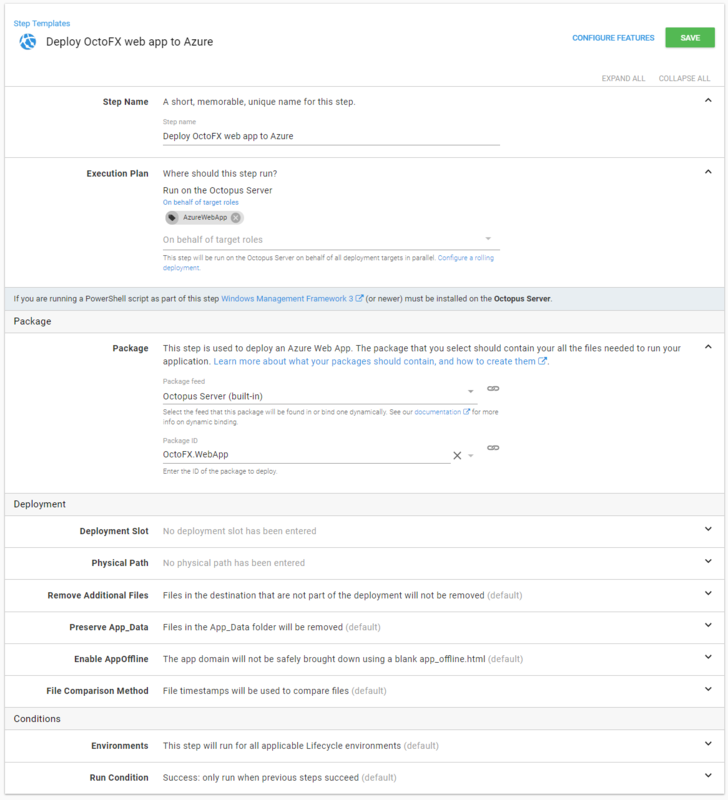 Octopus Deploy supports automated deployment of Azure Web Apps (formerly known as Azure Web Sites). The below guide explains how to add a step to your deployment process to deploy an application to an Azure Web App. Step 3: Configure your Azure Web App Step. What Happens When the Step is Executed? The Azure Web Apps you build, and how you might want to deploy them, are becoming increasingly complex as the Azure team provide more features to the platform. The best place to stay abreast of changes, and how they might affect your deployments is the Azure Web App Documentation, the many and varied ways you can deploy Web Apps (including Octopus Deploy). There is also the hidden gem of the Project Kudu GitHub repository where you will find many of the hard to find facts about Web Jobs (like the settings.job file, configuring a Continuous Web Job as a Singleton, configuring the Schedule for Scheduled Jobs, how shadow copying enables in-place deployments, and how to shut down gracefully). Deploying an Azure Web App with Octopus Deploy behaves very similarly to the Visual Studio publish wizard and uses Web Deploy to synchronize the files in your package to the Azure Web App. Similarly to Visual Studio you can change how Octopus Deploy invokes Web Deploy using the following options in your deployment steps which enable the most common deployment scenarios. All of these options are discussed below where we describe how to configure the Azure Web App step. The default values for these variables were chosen to match Visual Studio following the principle of least surprise. You will typically need to adjust these values depending on your specific circumstances. If you haven't already, create an Azure Account to grant Octopus Deploy access to your Azure Subscription. The below instructions are valid Octopus Servers running version Octopus 2018.5 and above. If you are running an older version, please select it from the Version green button at the top right of this page to enable the docs that suit your Octopus version. Add a new Deploy an Azure Web App step to your project's deployment process. Manually before running your deployment. See documentation. On the Package section, select your Package Feed and Package Id. On the Deployment section you can configure any of the below settings which are related to how your files are going to be pushed to Azure. Deployment Slot The target slot to deploy the application to. Requires a Standard or Premium App Service Plan. Physical Path The physical path relative to site root on the web app host. e.g. 'foo' will deploy to 'site\wwwroot\foo'. Leave blank to deploy to root. Enable AppOffline False When True instructs Web Deploy to place app_offline.htm in root deployment directory to safely bring down the app domain. File comparison method Timestamp Can be timestamp or checksum and instructs web deploy to use the selected algorithm to determine which files to update. Note: There have been some issues with checksum in earlier versions of web deploy, and we've written about that in detail here. Any of the settings above can be switched to use a variable binding expression. A common example is when you use a naming convention for your different web apps, like MyApp_Production and MyApp_Test - you can use environment-scoped variables to automatically configure this step depending on the environment you are targeting. The following features are available when deploying a package to an Azure Web App. Please note these features actually run on the Octopus Server prior to executing web deploy to synchronize the resultant files to the Azure Web App slot. They don't execute in the Azure Web App host you are eventually targeting. Download the package from the package repository. Extract the package on the Octopus Server to a temporary location. Any configured or packaged Deploy scripts are executed. Push your package content to the Web App in Azure. Cloud Regions: introduced in Octopus 3.4 to enable rolling deployments across multiple geographic regions. Environment-per-region: by creating an environment per region you can leverage lifecycles to create a strict release promotion process. The example we've discussed here is the most common scenario for deploying Azure Web Apps: a single package that contains an ASP.NET Web Application and some Web Jobs in the same release cadence. It is possible to implement more complex deployment scenarios where the ASP.NET Web Application and each Web Job follow independent release cadences. In this case you would build multiple packages using the folder structure expected by the Azure Web App hosting framework discussed earlier. 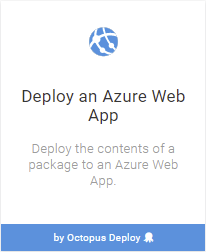 Once you've done that you can simply reuse the same Azure Web App Deployment Target to deploy each package when they are released.